Remember the 50’s musical “Singin’ in the Rain” where Gene Kelly sings the title song while being pelted by raindrops? It is one thing to sing and dance in the rain with an umbrella and quite another to live in it as do birds. How do they do it? A storm comes in on a low pressure center; this makes it more difficult for birds to fly simply because the air is less dense. Rain, or even water vapor (humidity) takes up more space, resulting in even fewer air molecules. This is why birds perch before and during a storm – it takes a lot more energy to fly in rainy conditions and so they avoid doing it. They perch in a tree, in shrubs or wherever they can get some protection. One scientist observed songbirds on the ground and huddled under shelter during Hurricane Katrina. But they also sit on power poles and lines where they face the wind and reduce their resistance to it. Birds are waterproof. Their feathers, made of protein similar to our fingernails, have interlocking barbs to make them both flexible and water resistant. Feathers overlap one another like roofing tiles to make the bird both aerodynamic and water repellent. Birds also have an oil gland at the base of their tail which they use to put a waterproof coating on their feathers. You may have seen a bird reach over its back as if it was scratching an itch on its tail; it is actually squeezing oil from the gland which it then spreads over the feathers. The outer feathers of birds protect the insulating feathers underneath, just if they were wearing a down jacket with a waterproof shell. Some birds, like egrets, have what is called “powder down”, fine granules like talcum powder that are produced by the decomposition of special down feathers and repel water. And birds have a third eyelid, a translucent membrane, which allows them to face the rain with protected eyes. Birds also have a special mechanism in their legs, a tendon that causes the toes to curl when they perch, giving them a tight hold on a tree branch in the blustery wind. 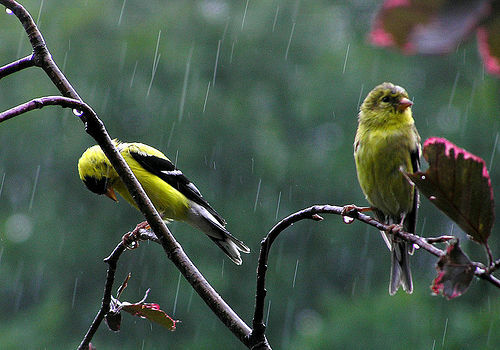 So birds do fairly well during a rainstorm, at least for a short time. But if the storm is particularly windy, rainy, or cold, or lasts for more than a few days, birds begin to show the effects. No one really knows how many birds die during a storm or series of storms. But mortality is certainly higher than usual. They fly into trees or windows, they get lost and wind up over the ocean or a large lake, their food sources are made more difficult to access at the same time they need more food to get warm, and they are more vulnerable to predators. So they hunker down and fly only when necessary. Thanks for the info. 10 to 12 morning doves and a few jays perch on a utility line near my house rain or shine until a Kestral Hawk shows up. Then they scatter. I’m a bit skeptical about the low air density explanation. The low pressure variation is at most 10% of normal pressure. You can get the same decrease in pressure and air density by climbing 3000ft. Do birds have difficulties flying at those elevations? Ten percent seems a small variation. It’s well known that birds perch more before a storm – the air pressure is lower. There have also been experiments where birds in barometric chambers were subjected to different air pressures. Those at lower pressures eat more – anticipating a rough flight – and those in high pressure eat less and are more active. Birds expend more energy at higher elevations, yes. Whether they find it “more difficult” is hard to define. Plus it depends on the bird. Most bigger birds are much more efficient in flight than smaller birds. Chickadees, for instance, would have a harder time flying than swans and the pressure would make more of a difference. I’m curious about this also. We have feeders, including Nijer feeders for Goldfinches in our back yard. It has been raining all week and almost all of the birds have disappeared. I’ve seen a few Crows and Bandtails but only one Goldfinch since Monday. Even when the sun came out for a few hrs on Wednesday the feeders were mostly quiet. What do the little songbirds eat when they are hiding from the weather. We typically have had from 8 to as many as 18 Goldfinches at our feeders this year. Birds don’t fly as much during low pressure events as it is harder to do so. They feed more near the ground. There is plenty of food around this time of year so feeders are not as attractive as they usually are during the winter.Plus birds are migrating and won’t be having around feeders as much. I found this site because I was recently in Rio de Janeiro and saw frigate birds soaring around at altitude in pouring rain. I was curious how they were able to do this but they can dive I guess and fly away afterwards so their feathers work wet or dry. Birds’ feathers are waterproof as they use oil from their oil gland on the base of their tail. Only sick birds or very unusual circumstances cause the feathers to actually be wetted. There are exceptions for some water birds, though, like Anhingas and a few others that need to spend a lot of time in the water. Why are so few dead songbirds found? The birds that can fly for more than a few months non-stop, what would their chances be of surviving rain for 40 days nonstop? Birds are waterproof so rain might be annoying and difficult but won’t generally interfere with flyling. Birds are waterproof so rain might be annoying and difficult but won’t generally interfere with flying.